Dressler Table Pads Click here to get a price quote and see that we have the lowest prices! Custom table pads made to the size and shape of your table. call 1-888-320-6845 if you have any questions. The SELECT grade pad is qpproximately 3/8 " thick and gives heat protection to 350 degrees. The SELECT comes in 12 color choices for the top and 2 Velvet choices for the base. Pad Locks are optional. The ELITE grade pad is qpproximately 1/2 " thick and gives heat protection to 575 degrees. The ELITE comes in 18 color choices for the top and 5 Velvet choices for the base. Pad Locks are optional. The ATHENA grade pad is qpproximately 9/16 " thick and gives heat protection to 800 degrees. Choose from 30 colors including premium vinyls for the top and 9 colors in either Velvet or suede-like cloth base. Pad Locks are included. 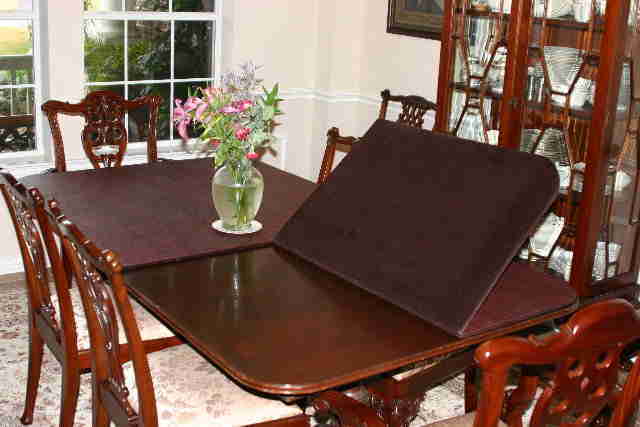 Dressler Table Pad Company makes custom table pads to protect your treasured dining room table. We will protect your buffet table, coffee table, dining table and conference table. Table pads should be made to protect your table from spills, dents, moisture and heat so you do not have to worry about damage to your table. That is why we manufacture every one of our table pads to your specifications. We offer three grades at various prices so one of our grades will suit your budget and protect your table. Our pads are beautiful, durable and perfect every time.